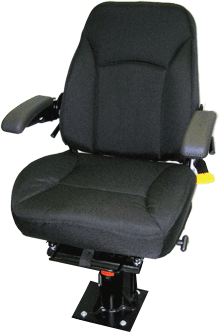 Authorized distributor of Seats, Inc. locomotive seating. Seats Inc. offers premium suspension, custom seat designs and incorporate the latest ergonomic features for operator ease of use and comfort. Offered in both mid-back and high-back models, they feature sturdy steel construction with choice of upholstery. They are produced to the highest specification of quality, reliability and durability.